This page serves as a comprehensive resource guide aimed to provide you with all you need to know about freshwater fishing to get started or improve your luck. Whether you are a beginner or an expert at seeking and seizing your ideal freshwater catch of the day, this guide can educate you on what exactly freshwater fishing entails, what equipment you might need for the activity, the different species found in freshwater, as well as some tips and tricks to ensure your luck. Read and share with fellow anglers so that you can be ready to make your next freshwater fishing trip a productive one. Or, to otherwise satiate your curiosity on the subject, read on to learn more about this popular pastime. Freshwater fishing is fishing done in a body of water with less than 0.05% salinity. In the United States alone, there are approximately 44 million anglers who partake in this popular outdoor activity. Although the globe is covered by approximately 70% water, less than half of that has been identified as freshwater. However, do not let the numbers fool you: there are still plenty of places to visit in order to snag a good bass or walleye. Although some individuals who go fishing for fun with friends and family may not give much attention to whether they are looking for their catch in freshwater, salt water, or an estuary with brackish water, there are some distinctions that make freshwater fishing a category of its own. You will only find certain species of fish in freshwater, for instance, which is discussed in more depth below. In addition, there are evidently certain locations across the United States and worldwide that have been identified as ideal freshwater fishing spots. Freshwater most commonly is found in certain lakes, streams, reservoirs, pools, rivers, and ponds. Some of these bodies of water are natural while others are man-made, and the same can be said of their salt content to some degree. Freshwater fishing may be particularly enjoyable for those who enjoy fishing from a boat, although you can also fish from on-shore. In general, this type of fishing may also appeal to beginning anglers based on the sheer variety of locations you can visit in order to partake, as well as the relatively few pieces of equipment you need to start you off. Experts, of course, are free to get as fancy with their fishing techniques and gear as they please. Getting some knowledge under your belt about the different types of species you will find in various freshwater habitats will help you along in ensuring you do not leave your fishing trip disappointed. When it comes to the various bodies of freshwater you may encounter when you go fishing, the fish can broadly be categorized into the types of coldwater and warmwater fish species you can expect to find. The temperature of the water is associated with the level of oxygen available at each range, which may be more or less ideal for the survival of certain species of fish. Cool or coldwater fish are those that require higher oxygen levels to survive – comfortably or otherwise. Species that prefer temperatures ranging between 50 to 60 degrees Fahrenheit are more likely to be found in northern states within the U.S. Areas of higher elevation may also be home to these fish as the temperatures are more capable of supporting the cool water temperatures. Those that best survive or otherwise prefer waters that are not quite warm but comfortably fall within the range of 60 to 80 degrees Fahrenheit – or cool water – may be found in both northern and midwestern states in the country. Warmwater fish species are those that have higher rates of survival in waters that measure an approximate 80 degrees Fahrenheit. They can still fare well enough in cooler waters, however, and therefore may still be found cohabiting bodies of water in northern states with the cold-water species. But every angler has their own goals in mind. The stock of each species may vary depending on the location, but whether traveling near or far, you may be pleasantly surprised by the variety you encounter. However, you if you are looking for a specific species, be sure to research local fishing spots for tips and observations from other local fishers. 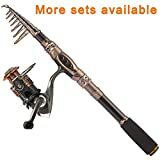 If you are familiar at all with the general activity of fishing, you will know the basic equipment: a fishing rod, your tackle, and your bait. Arguably your rod is the most essential of these items as it serves as the casting tool that makes your catch possible. Fishing rods can extend your reach, provide leverage, and may be available in a number of designs based on your preferences for size, weight, type of grip, and more. 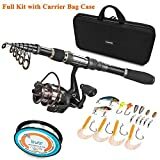 Nonetheless, just as you need more than flour to bake a cake, additional fishing accessories and gear serve their own important purposes as well. Note: Based on the certain species you fill find in these waters, be sure you are properly equipped with equipment that is specifically designated for freshwater fishing, as tools for other types may differ. Keep an eye out for freshwater rods, freshwater tackle, and freshwater bait when you are gearing up for your first or next fishing trip at body of freshwater. Fishing Lures – These help to attract fish, as their name suggests. Rigs – Rigs are what allows you to tie and secure your lures, bait, hooks, sinkers, and any other accessories to your fishing rod. Hooks – These are available in a variety of sizes and types suited for freshwater rods. They are typically manufactured out of some type of steel (stainless steel, high-carbon, or alloyed with Vanadium) and are generally referred to by their measured size which, for freshwater hooks, ranges from the smallest size of 32 to 19/0 as the largest variety. Tackle Box – This handy tool box will contain your fishing accessories, convenient for your use. 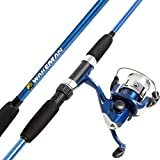 Additional fishing accessories, such as dodgers, sinkers, flashers, swivels, and bobbers – may be used at your leisure, or by recommendation from specialists at your local fishing gear shop/supplier. Ready to pack your tackle box and hit up your closest river or stream? This next section outlines the most trusted tips and tricks offered by avid anglers that can help you to improve your luck on your next fishing trips. Use the best live bait. The best bait to lure in freshwater species tends to be soft shell crayfish, worms, and minnows. If you are intending to catch a specific species, look into what bait may be most effective, as different types of fish may better respond to different types of live bait. Locusts, for instance, are rather good for baiting bass. Artificial bait – such as spinners and other pieces that may be purchased at any fish shop – may be used as well. Pay attention to how the fish seem to be reacting to your fishing lures. While they are obviously meant to attract more fish to your rod, shinier lures may also carry the risk of reflecting light from the sun towards the fish, causing confusion and thereby repelling them. A suggested alternative is matted-metal lures. Cast close to the shoreline. For beginners especially, you are likely to get more bites staying close to the shoreline than if you were to cast your lines further off. Go old school and dust off a map. Preferably a topographical map that outlines the varying depths of your chosen body of water. Different fishing techniques may be more effective for catching fish at different depths and distances from shorelines. Wash your hands first. Believe it or not, fish have a keen sense of smell, and those that inhabit freshwater in particular may be more sensitive to foreign scents. Be patient with the process. Don’t expect the first few minutes, or even the first hour, to necessarily be a scurry of fish vying for your fishing hook. Securing a catch, or even a bite, can take time – more or less so depending on the fish populations in the specific area. Bring a book, a radio, or better yet – a few friends to help pass the time. If you are planning on catching and releasing your fish, make sure they are out of the water for as short a time as possible. Depending on your state’s laws and regulations for freshwater fishing – as well as your own preferences – some fish may need to be released. In these cases, try not to have the fish out of the water longer than you can hold your breath.